(Nanowerk News) A team of scientists at UCL led by Peter Barker and Tania Monteiro (UCL Physics and Astronomy) has developed a new technology which could one day create quantum phenomena in objects far larger than any achieved so far. The team successfully suspended glass particles 400 nanometres across in a vacuum using an electric field, then used lasers to cool them to within a few degrees of absolute zero. These are the key prerequisites for making an object behave according to quantum principles. The study is published today in the journal Physical Review Letters ("Cavity cooling a single charged nanoparticle"). Quantum phenomena are strange and unfamiliar. These include superposition, where the position or energy of a particle exists in two or more states at the same time and entanglement, where two particles share the same state (and change in tandem with each other) despite not touching. But quantum phenomena are only observable in the smallest of objects, such as atoms or molecules, and are typically very short lived, just a fraction of a second. Moreover, the act of observing them, or of them interacting with their surroundings, is enough to destroy the quantum state. "Tiny objects like atoms behave according to the laws of quantum physics," says James Millen (UCL Physics & Astronomy), lead author of the study. "Large objects, like the ones we see around us, don't. But there's no obvious cut-off for where quantum behaviour should end. The largest objects that have been made to behave in a quantum manner are large molecules of about 800 atoms. We are trying to do the same with glass particles made up of billions of atoms, around the same size as viruses. This is small on human scales, but it is enormous as far as quantum phenomena are concerned. It's even big enough to see with the naked eye if you make light glint off it." Inducing quantum states in objects requires powerful cooling, to bring the temperature close to absolute zero, when atoms stop vibrating. Widely-used technologies, such as laser cooling, that work for atoms won't work for such large objects, and a related technique called cavity cooling must be used. 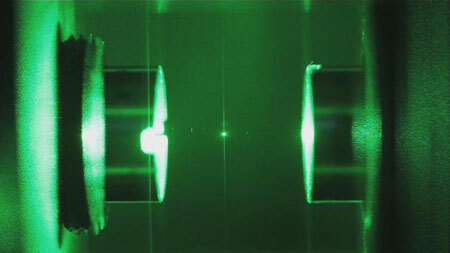 During cavity cooling, a particle is suspended by a laser light field contained between two mirrors, which has a very carefully calibrated wavelength. The laser light can hold the particle steady (a phenomenon known as optical tweezing) and draw motional energy out of it at the same time. However since the laser light can sometimes actually heat the objects up this method has not been shown to work before. "Our solution was to combine the laser beam that cools the glass particle with an electric field which makes it levitate," Millen explains. "The electric field also gently moves the glass particle around inside the laser beam, helping it lose temperature more effectively." The team are still a few degrees short of the temperature required to create quantum behaviour in the glass nanospheres, but with improved mirrors, this should be relatively easy to do. And once sufficiently cooled, the team believes the nanospheres should behave according to quantum principles. Once successfully implemented, the technology could allow for highly accurate motion sensors that could detect the slightest tremor, to key tools in quantum computer networks. Since the particles currently used in quantum experiments are tiny, they have negligible mass and so barely interact with gravity. Observing quantum effects in large and heavy objects like these nanoparticles would also shed light on the role of gravity in quantum physics.